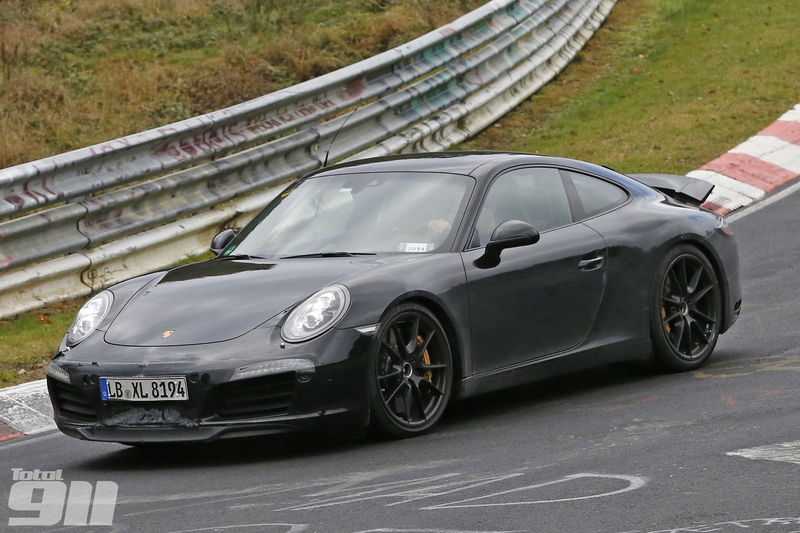 Following on from our first spy shots back in August, the Porsche 991’s successor has been spotted testing again, this time pounding around the Nürburgring Nordschleife for some performance testing. Not much has changed aesthetically to the second generation Porsche 991 however, Zuffenhausen’s ex-WRC champ, Walter Röhrl, tested two different styles of front spoiler, as our photos attest. Röhrl was spotted testing two different styles of front spoiler on the second generation 991 prototype. With the winter testing season now upon us, we expect to get a better look at the Porsche 991’s successor in the coming weeks as Stuttgart readies the latest 911 generation for its launch, expected to be towards the tail end of 2015. Compared to the more traditional lip above, this front spoiler has a more pronounced centre section, similar to the 911 Turbo.